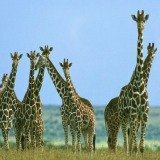 To get started in a review of wildlife animals in Africa, the big five safari animals is a good place to start. When elephants approach you during a safari trip, switch off your car engine and give them space to pass. Will you be able to tell the mock charge of an African elephants from a serious charge? You will often see these animals in and around water where they enjoy showering by sucking water into their trunks and spraying it all over themselves. Afterward, they often spray their skin with a protective coating of dust. The African elephant is the largest living land mammal with a prodigious appetite and you will see these hungry animals eat roots, grasses, fruit, and bark for most of the day. Lions have no specific habitat preference so you could expect to see them anywhere during your bush trip. How effective are African lions when hunting ? See how all this harmony changes when they feed on a kill and everything degenerates into squabbling over the sharing of the kill. You will often spot buffaloes on their way to water after their night feeding. They require large spaces and you will see them feeding on grasses of various length. 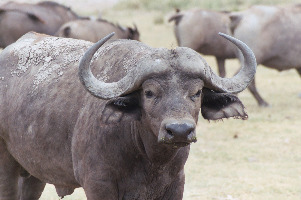 Both male and female buffaloes have heavy, ridged horns that curve downward and then up. The hollow horns of these African animals are formidable weapons against predators. Do you know what the privileges are of a high social ranking in African buffalo circles ? Buffaloes have earned a bad reputation from hunters and other people who come in close contact with them. They are unpredictable and can be dangerous if cornered or wounded. How do you tell the difference between a white rhino and a black rhino? These African animals are actually different not in color but in lip shape. 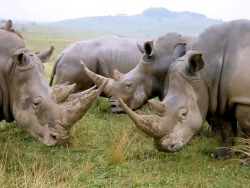 The black rhino has a pointed upper lip while the white rhino has a squared lip. The difference in lip shape is reflected in the animals diets. Although leopards are well represented in Southern Africa their secretive and elusive ways and mainly nocturnal habits make them difficult to spot on an African safari. This beautiful, elegant, and powerfully built African animal has a tawny coat, which is covered with dark, irregular circles called rosettes. This shrewdest of the large carnivores is a prize encounter on all game drives. Dense bush in rocky surroundings and riverine forest are their favorite habitats. 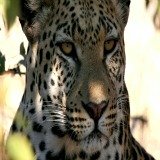 Want to know how leopards hunt their prey? 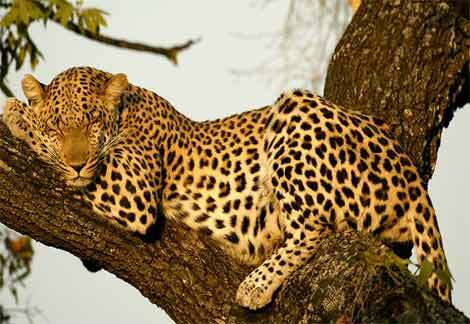 The spotted coat provides almost perfect camouflage when they rest during the daytime in trees or thick bush. Both lions and hyenas will take away the kill if they can. To prevent this, leopards store their larger kills in trees where you can often see them feed on it in relative safety. 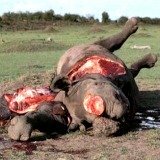 Look out for white rhinos in grassland areas with trees and water. You will notice them spending most of their day grazing on grasses, walking with their enormous heads and squared lips lowered to the ground. To distinguish them from their black counterparts, notice the pointed, often tufted ears, flattish back and elongated head and look for a calf that usually runs ahead of the mother. Done with the big five? 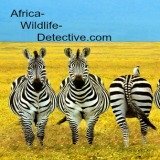 There many more interesting African wildlife animals beyond the Big five.